The “Error 503: Valid RCPT command must precede DATA” telling you that your Outgoing Mail (SMTP) connection was not properly authenticated by your email server. I suggested him to make some modifications in his email configuration settings. When he made the changes, outlook emails started working. 5) From the More Settings window, select the “Outgoing Server” tab. 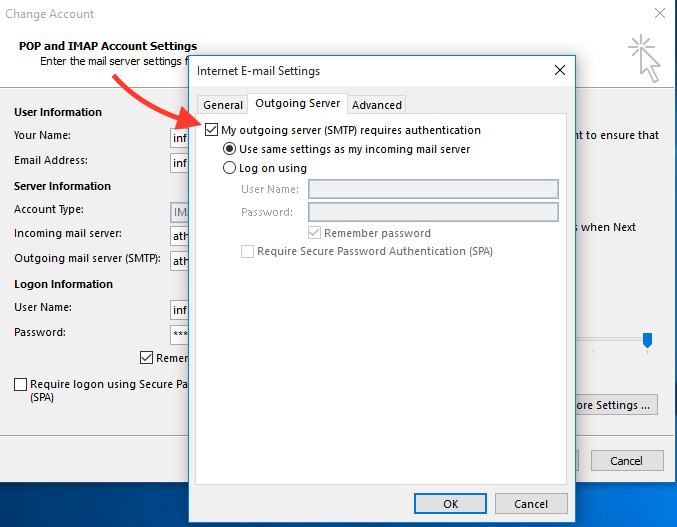 6) Check “Outgoing Mail Server (SMTP) requires authentication” and make sure “Use same settings as incoming mail server” is selected. 7) Open the “Advanced” tab. 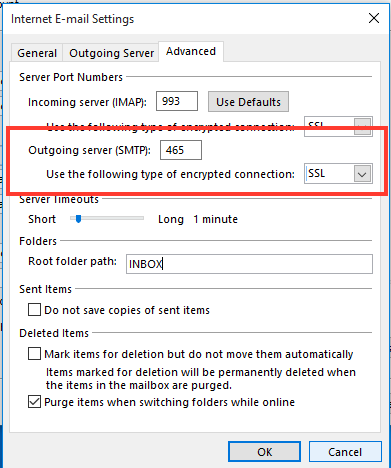 8) In the Advanced tab, set the Outgoing server (SMTP) port to 465. In the Use the following type of encryption drop-down, select SSL. 10) On the Internet E-Mail Settings window, click “Next“. Now start sending email and it will work. If, for some reason, the above steps fail, please contact HostOnNet Support for further assistance.